Those following on facebook might have read about my friend Japie’s suprise Bday party last weekend where me and some friends served some BBQ goodness. Not that there was much surprise left since he knew almost all about it by the time the party started (eventhough it was a few months before his actual birthday). The menu however was still a secret I guess. These smoky mussels were a part of the appetizers we served. 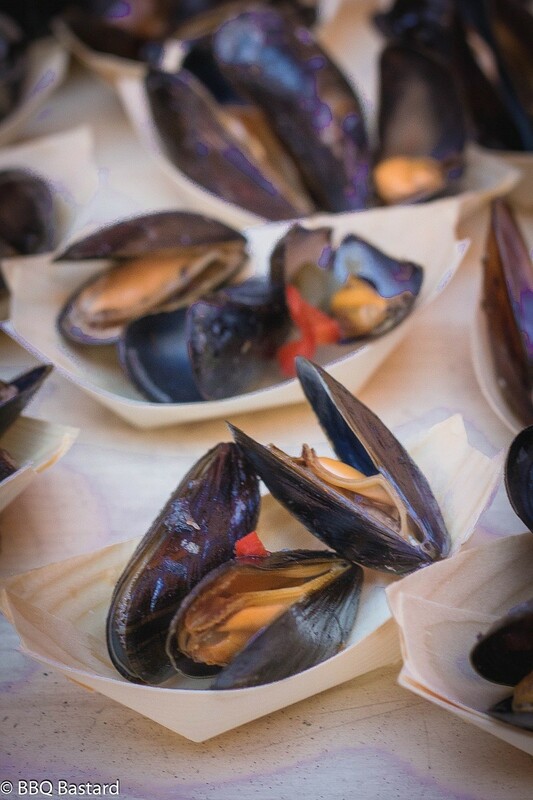 Inspired by the Urthel Saisonière Mussels Birger Allary presented us earlier along the trail of passion. Disclosure: "This post contains test products and affiliate links, which means that if you buy one of the products through the mentioned links, I'll get a small commision to keep this blog running. All opionions shared are my own." 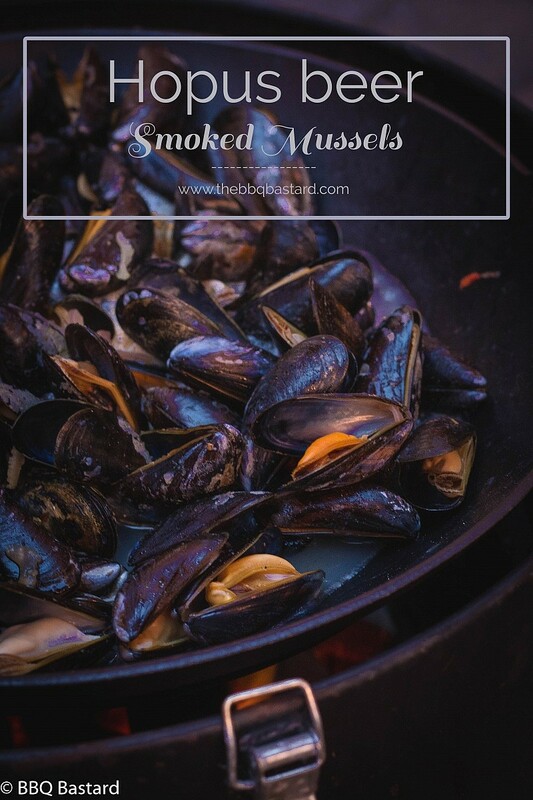 Anyway last weekend we served the smoky mussels as an appetizer along many other goods. Scampi saltimbocca, ABT’s, quesadilla’s, … to name a few and three kinds of ribs as dessert. 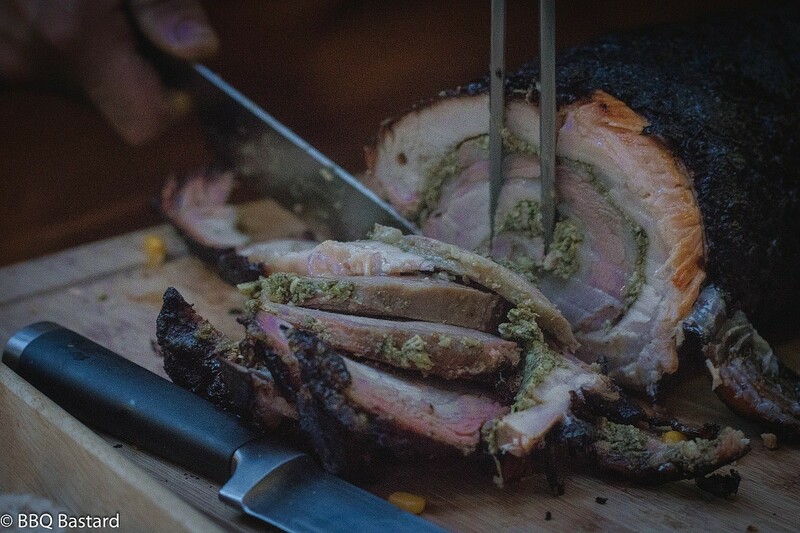 The real star of the night to me was the Porchetta by my pitmaster companion Maarten. What a delicious piece of meat! As for the mussels this is a rather easy recipe. 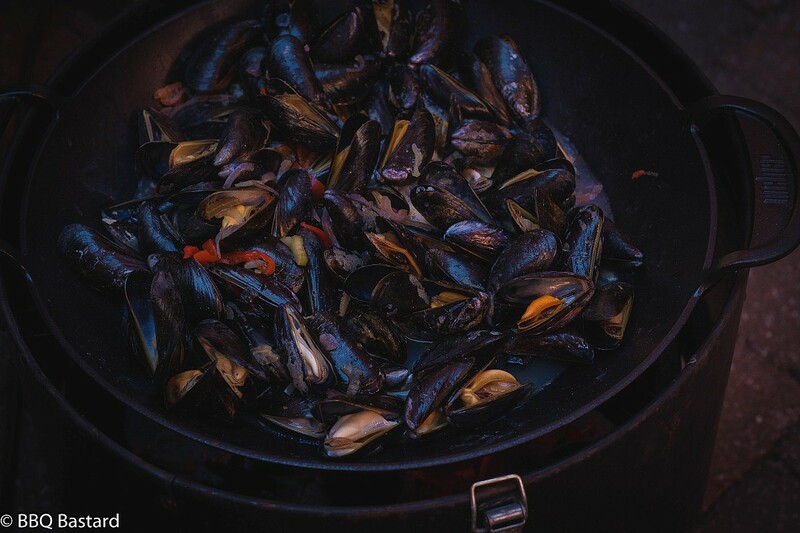 All you need to take care for is taking control of your beer intake so you notice when you need to remove the mussels from your pit so they don’t dry out. Ok I correct myself: “this recipe might hold some challenges.” I used a Cast Iron Wok like this one. Mine is one by Weber but I guess there’s not much difference in these. The other part I made in my dutch oven. I use a cheap dutch oven I bought in the supermarket a while ago that works pretty well. I only don’t dare to put some Coals on top of the lid. It’s not needed in this case but for baking it would be a good extra option. If you’d like to bake a Cast Iron Dutch oven like this one might be more appropriate. I’ve prepared the vegetables earlier that day to be able to serve the mussels fast and well flavored without losing to much time. Especially if you’d like to eat the vegetables too you might want to put them in the Dutch oven a bit before you add the mussels so they can release their flavor and soften a bit. In this stage I added the seasoning too. The party night itself I enflamed a high direct fire and tossed in some wood chunks. Once the wood started smoking I put the dutch oven and wok on top of the fire, added the mussels and a hoppy blond beer and closed the lid of the BBQ (not the lid of the dutch oven or you won’t get any smoke). It takes about 5-10 minutes until the shells open up. Halfway the cooking process you should shake up the mussels so the heat gets equally devided among the mussels. Otherwise the mussels on top might be closed while the others are done. Serve them as an appetizer or with a french fries and a good beer. I hope you got some Hopus or other blond hoppy beer left? Given the reactions I got I think I could say the smoky mussels were a hit! Some people asked the recipe for this (hope they’re reading). What better compliment than hearing people start cooking your recipe could you get? So I hope to read about your session too. Feel free to share your experiences in comment below or on social media! Prepare your BBQ at medium fire (+- 200*C/400°F) Add some smokewood to the fire. I used port soaked oak wood I received to test from Smokewood Germany. Take a wokpan or Dutch Oven, put it on your BBQ and add some vegetable oil. Once the oil is hot you toss in the vegetables. Season the vegetables at taste with Santa Maria Style seasoning (I used 2 tbsp) and let them simmer for a while until they get soft. Add a bottle hoppy blond beer and wait until the beer begins to boil. Add the mussels and cook until they open up. While doing this you add some fire herbs to the fire. Obviously we don't use the lid of the dutch oven but you need the lid of the BBQ to get the smoke in your dutch oven. This takes about 5-10 minutes. Shake the mussels up after a couple of minutes. Serve these delicious Mussels accompanied by some bread, belgian fries, ... but most of all a delightful chilled beer. "This post contains an affiliate link for the Cast Iron wok and dutch oven: This means I'll earn a small commission if you buy these products through the affeliate link above used to keep this blog running." "For this post I used Smokewood I received as a testing sample by smokewood Germany. Besides the product I do not get payed to promote their product." All opionions shared are my own.